Hand making your own pasta is a labour of love …. and tastes simply divine! It helps if you have pint size helper around…. Pulse the flour in a food processor a few times, to give it a little air, and fluff it up a bit. In a measuring bowl combine eggs, oil and water – beating lightly. Slowly pour the wet mixture into the food processor, while the flour is being aerated. The mixture will form a ball, attached to the blade. If this doesn’t happen, and the dough is wet and sticky, just add bits of flour until it does. If the dough is too dry, just add water, 1 tbsp at a time until it forms a ball and holds on to the blade. 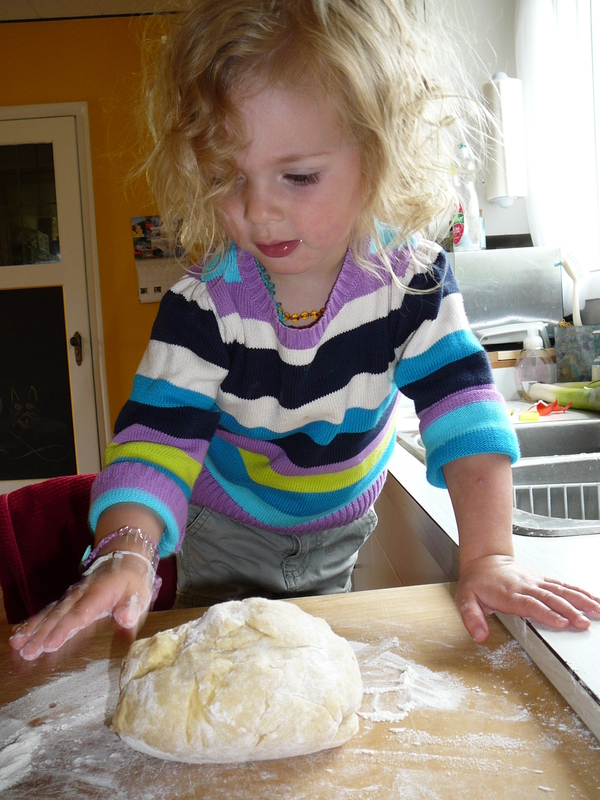 Turn onto floured surface and knead for a minute by hand. The dough should feel soft, smooth and just a bit stretchy. It is important to let it rest before shaping your pasta. Wrap tightly in plastic wrap. If using within a few hours, just let it rest at room temperature. The dough is good in the fridge for a couple of days, and can be frozen for up to a month or so – allow to defrost in the fridge then bring to room temperature. When ready to roll, cut your dough into 6 pieces to make it easy to work with. Keep the pieces you aren’t using either in plastic wrap or in a floured tea towel. Working with 1 piece at a time, flour well, and roll through your pasta press at the largest setting. Once you have worked it down a couple of settings fold in triple, and return to a large setting to run it through again. This seems to knead the dough that little extra bit and makes it so tender. Continue putting through your roller until you end up on about (on mine anyway) setting 3. This works well for putting through the shaper to make spaghetti, linguine etc. Make sure to flour well before putting through press – adding flour as necessary to make your dough easy to handle. If you don’t have a pasta press you probably aren’t going to the trouble of hand making pasta … but if you are …. just use a rolling pin or wine bottle, whatever you have on hand and roll the dough until thin enough and cut into strips. Really not hard! Keep all the prepared pasta covered on a floured tea towel until ready to use. Or if you have one of these handy drying racks you can put it to use – I used to have wooden spoons strung out all over the kitchen before I got this gadget from Hayley, Mike and Sloan. To serve, have your pasta sauce simmering away in a saucepan beside the pasta pot and gradually add the pasta to it – adding pasta water as necessary. Stir the pasta through the sauce, taste and season as necessary with salt and pepper. Finish with a grating of fresh cheese. This is enough pasta to serve 6-8 people. 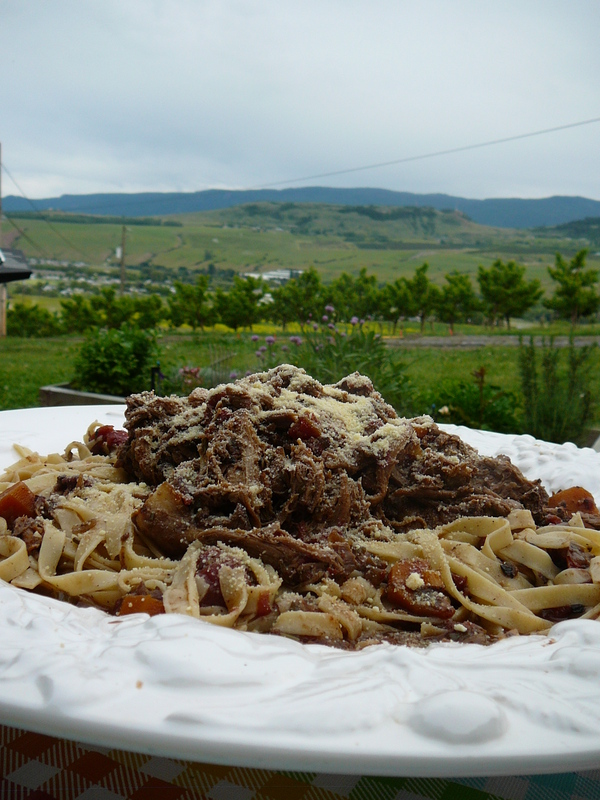 Here it is served my Italian Pot Roast …. look for that yummy recipe too! This entry was posted in Pasta, Recipes and tagged pasta, pot roast, stew by Chatty Kathy. Bookmark the permalink.